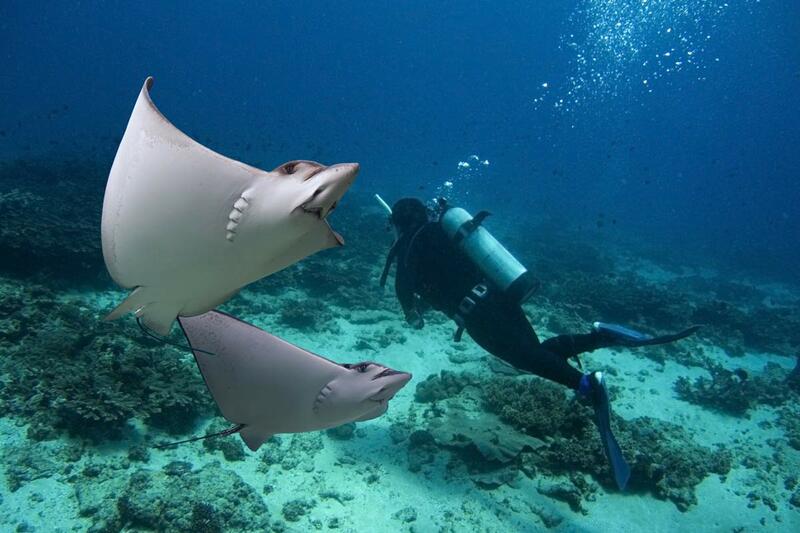 Most of the diving in Lhaviyani Atoll is in the northern half of the atoll where the resorts are located. They all share the pristine dive sites in the region and have many quality dives to choose from. The atoll has very few thilas, but many excellent channel dives. There are 13 channels on the western side, seven on the east and six wide ones in the south. In the north, the channels are generally quite narrow with excellent coral and plenty of fish around the entrances. 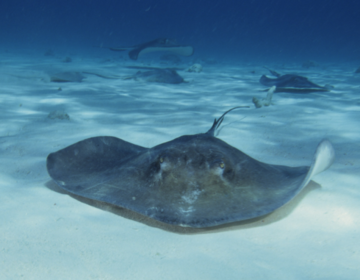 When conditions are favorable, divers can cross the channel openings where many chance encounters with sharks, eagle rays and other large fish occur. Surprisingly, there are not too many coral reefs inside the atoll, but some occur near the channel entrances. These reefs are shallow and well protected and generally have interesting reef features. On the outside of the atoll are a few sites with steep walls and beautiful cave, providing good alternatives, especially when currents are strong. There are also two wrecks at the ‘shipyard,’ giving divers an excellent variety of dives all within a relatively small area. Chance encounters with eagle rays across the channel occur. Between three and 25 meters are a series of caves with sandy bottoms. They are filled with bright yellow soft coral and sea fans. 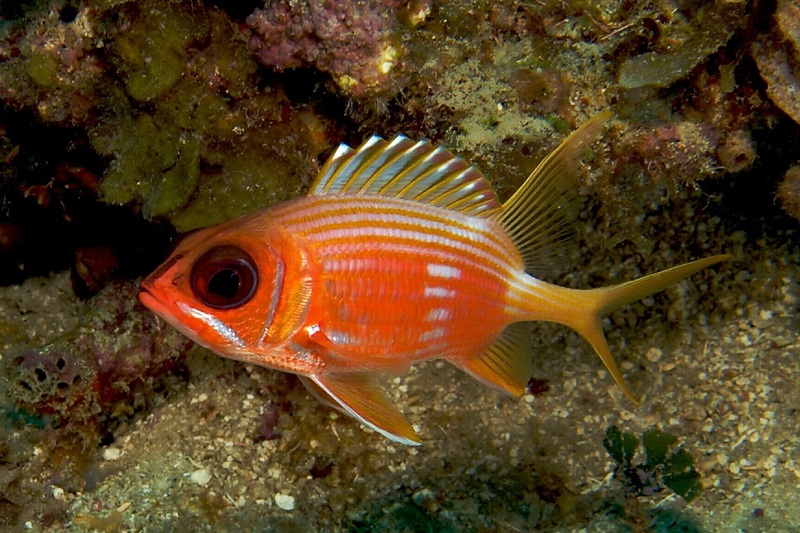 Squirrelfish inhabit the caves while outside are big schools of fusilier, snapper and reef fish of every description. The house reef dive is opposite the jetty and marked by three buoys. Divers start at the floats and then cross the lagoon at the end of the dive. 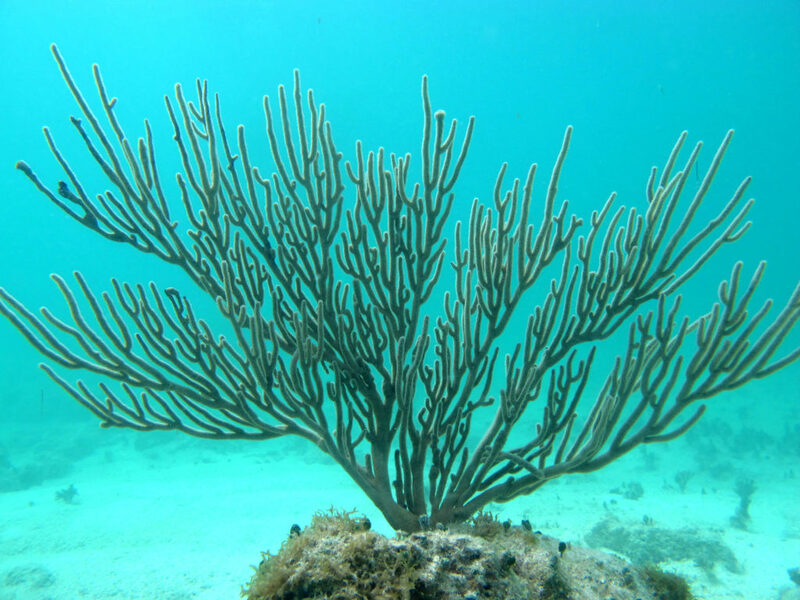 The reef has table coral and ledges with soft coral. There are white-tip reef sharks, eagle rays, turtles, and schools of fusilier. The steep outside reef of Kuredhdhoo features some beautiful caverns and reef formations. At this dive site, there are two sets of enormous caverns with ceilings covered in brightly colored soft corals. There are swim-throughs and many nice angles creating perfect opportunities for photographers. The first set of caverns are found at 25 to 32 meters while the second set is shallower at eight to 16 meters. Many nice angles create perfect opportunities for photographers. On the south side of Huravahli, the reef has a completely vertical wall, ending on the channel bottom at 33 meters. The dive site is relatively long and makes for a perfect drift dive. Divers can choose their depth and see large overhangs from 25 to 30 meters, ledges at 20 meters and smaller caves between 15 meters and the surface. Divers will be impressed by the variety of marine life at the wall with many smaller fish occupying the vertical spaces. Another exhilarating channel crossing between the outside reefs of Gaaerifaru and Hinnavaru. 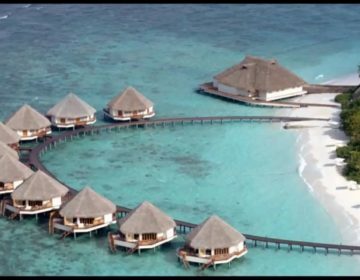 Like Felivaru Kandu, it offers a wide range of schooling fish, white-tip reef and grey reef sharks, turtles, and eagle rays. 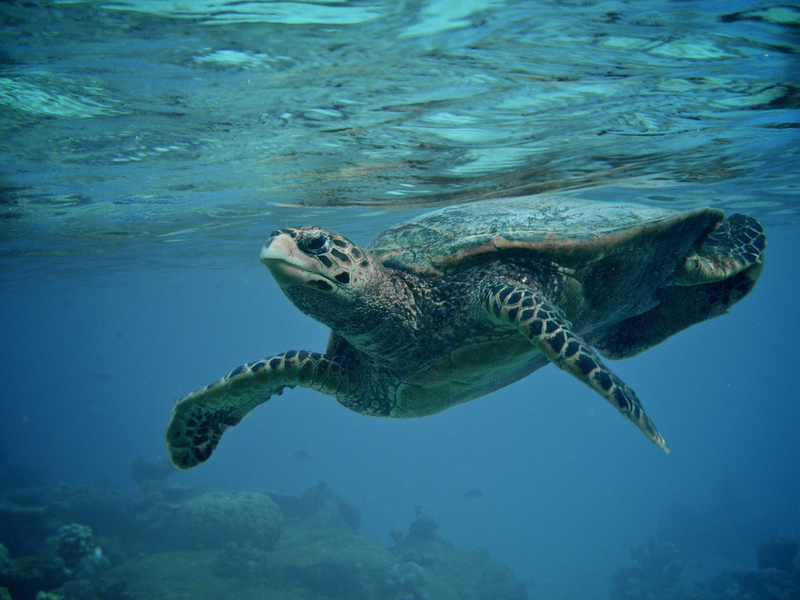 Gaaerifaru is home to grey reef sharks, turtles (seen above), and eagle rays. There are two wrecks in the channel that separates the islands of Felivaru and Gaaerifaru. The site is easy to find as one of the wrecks; Skipjack II has the bow protruding five meters out of the water. The ship was the mother ship for the Felivaru fish factory and spent some years permanently moored to the jetty at Felivaru. In 1985 it was decided the old Japanese ship was of no further use, so it was stripped of anything of value and towed out to sea where it was to be scuttled. 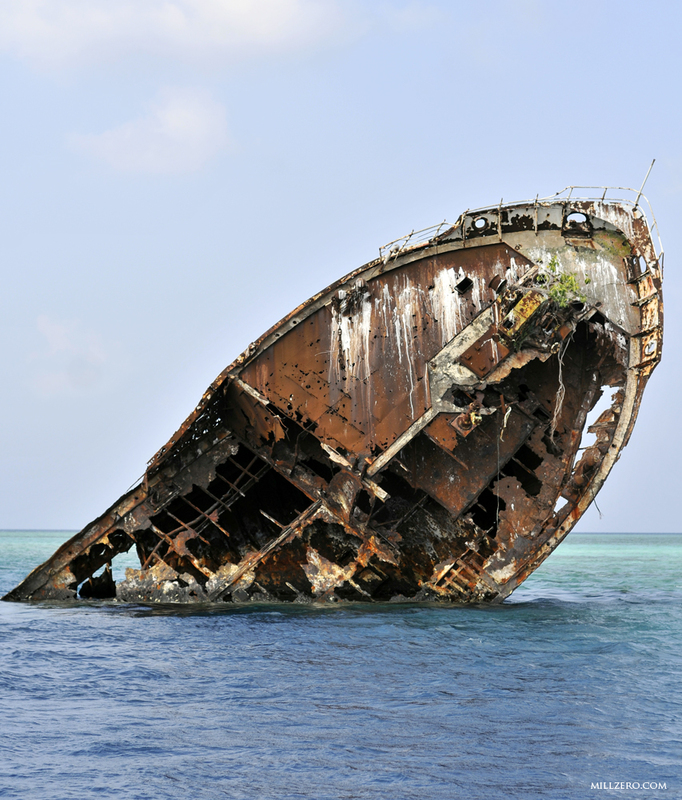 The shipwreck is now one of the main diving features in Faadhippolhu Atoll. The second wreck was also in use at the fish factory and was scuttled at the same location. It too was in a vertical position until 1992 when a storm caused it to settle on the sea floor. The Skipjack II has the bow protruding five meters out of the water. Photo credit: www.millzero.com. The stern of the upright ship lies on the bottom at 29 meters. The second week lies 40 meters away on its port side in 28 meters of water. In a remarkably short time, the wrecks have been inundated in soft and hard coral, no doubt because of the strong currents streaming through the channel. There are caves at 18 meters with scorpion fish. In the wrecks are many morays, which glance inquisitively at divers from the protection of their metallic refuge, and in every recess are huge schools of yellow sweeper that glisten blindingly in torchlight. The wrecks have become home to a multitude of fish, including boxfish, pufferfish, porcupinefish, Napoleon, emperor, angelfish, surgeon, and red bass. A school of tallfin batfish allows divers to come close and lying on the bottom of the wreckage it is often possible to see a nurse shark. 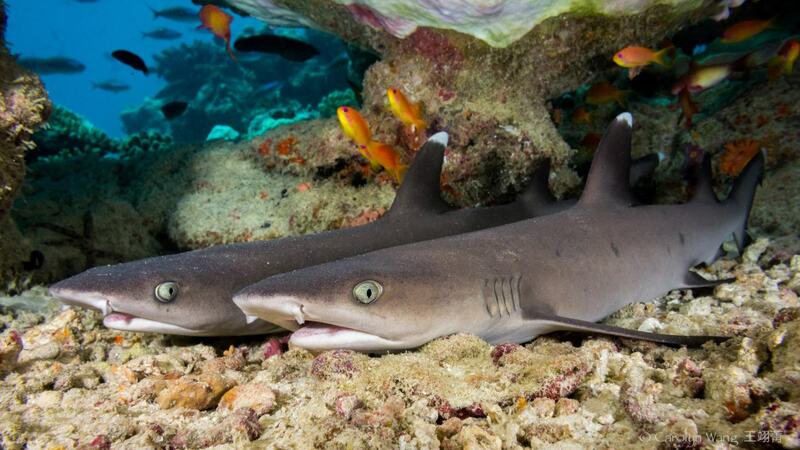 In the channel, pelagics and grey reef sharks are regularly sighted. 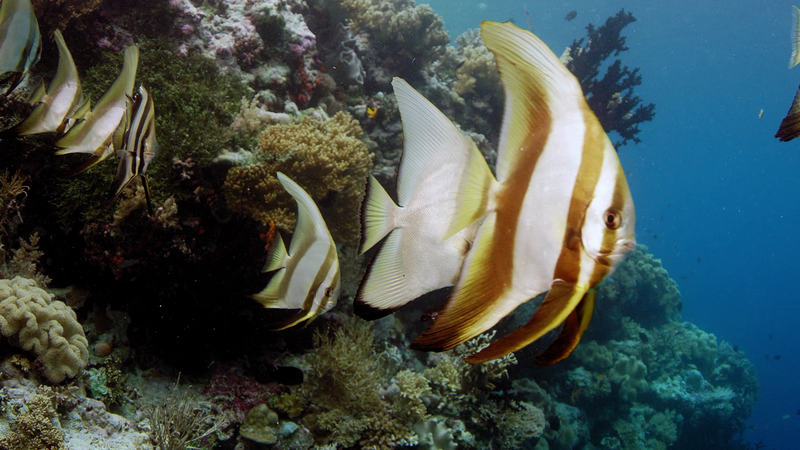 A school of tallfin batfish allows divers to come close. Strong currents in the channel can make diving at the wrecks difficult. Some protection can be found on the lee side of the upright wreck but beware of strong current suction between the wreck and the reef. When conditions are favorable, the site is perfect for both beginners, and advanced divers as the wreck is standing upright with the bow breaking the surface. On the north side of Felivaru by the fish factory, is an outside reef and channel dive where the sloping outer reef offers some extraordinary diving. 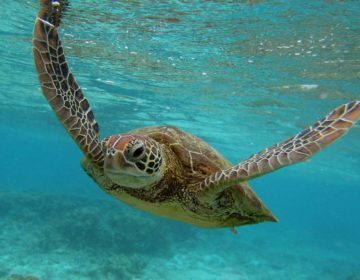 The main reason for going here, however, is to cross the channel between Felivaru and Gaaerifaru, where divers are likely to see likely to see schools of eagle rays, turtles, white-tip reef sharks, and many smaller grey sharks when the conditions are right. A quite small, but interesting inner reef about 25 minutes away from Kuredhdhoo. Steep slopes, overhangs and coral outcrops standing separately on the sandy bottom together with a nice, intact and colorful reef top makes this an ideal dive, especially for photographers. 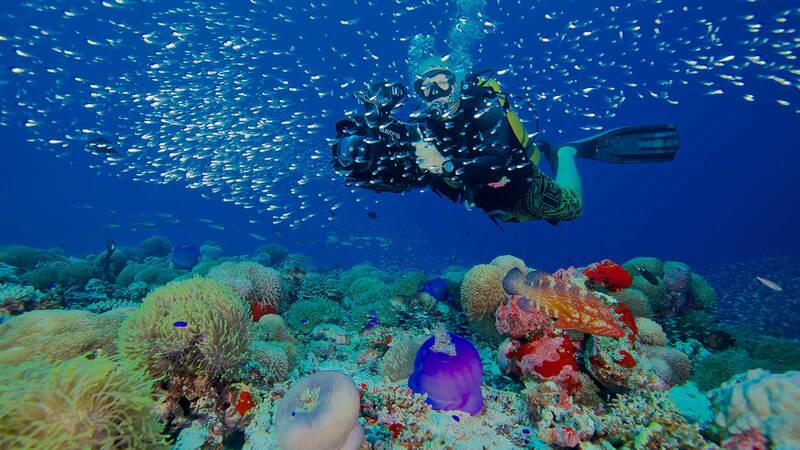 Gorgonians, sea anemones, moray eels, lionfish and many of the usual reef fish cover this reef from beginning to end. An exhilarating inner reef dive. Gorgonians cover this reef from beginning to end.